Jesse the Litsch threw 2+ innings for the Lansing Lugnuts yesterday, as part of his rehabilitaton. Read of that drama at 1 Blue Jays Way. The Toronto Maple Leafs Baseball Club, who play every Saturday (2pm) at Christie Pits, have finally updated their website to one that is less reminiscent of the video game Pong. Former Canadian Olympian Paul Spoljaric has retired. 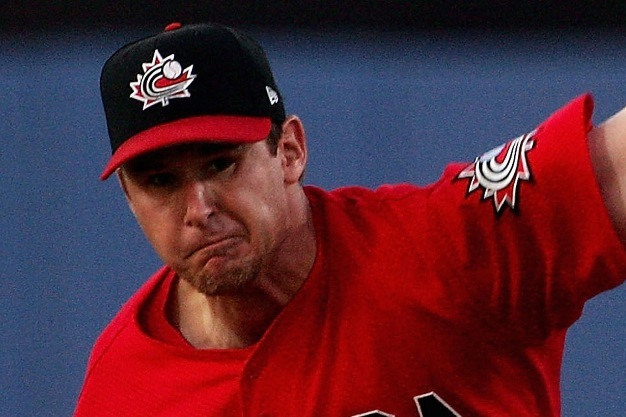 Spoljaric pitched six seasons in the big leagues with the Toronto Blue Jays and Seattle Mariners. He hung on until age 40, pitching among the best of the Intercounty Baseball League for the Toronto Maple Leafs and Barrie Baycats. Former Jays badboy Josh Towers left his job with the Diablos Rojos of Mexico City for a return to employment in United States with the Camden Riversharks of the Independent Atlantic Professional Baseball League. More updates on Josh to come. Alex Anthopolous cautiously mused about the possibility of Dustin McGowan, who touched 96 m.p.h. the other day, joining the starting rotation come September. How this would relate to his status on the Blue Jays roster, and another potential contract renewal, will depend largely on his progress in the 30 days following the end of extended spring training, at which time McGowan will have to either join the 25-man roster or clear waivers, in order to continue rehabbing with a Jays minor league outfit. Anthopoulos spoke this afternoon with Bob McCown and Stephen Brunt on Prime Time Sports about Dustin, the state of the Blue Jays rotation, and the implications of Yunel Escobar’s new contract.